South Korea’s biggest mobile carrier SK Telecom said Monday it is working to establish a 5G-powered infrastructure in the country’s Army academy to deliver futuristic technologies to the military. The telecom firm and the military school signed a memorandum of understanding at the Korea Military Academy in Seoul to build a “smart military campus” within the first half of this year. The two sides said the agreement will pave the way for incorporating 5G-based technology in combat training for young cadets -- ranging from basic shooting to tactical military planning. “The best way to understand (the changes) is to think of it as a military version of ‘Ready Player One,’” SKT said in a press release, comparing its efforts to use virtual reality technology for shooting drills to futuristic scenes in Steven Spielberg’s 2018 sci-fi film. 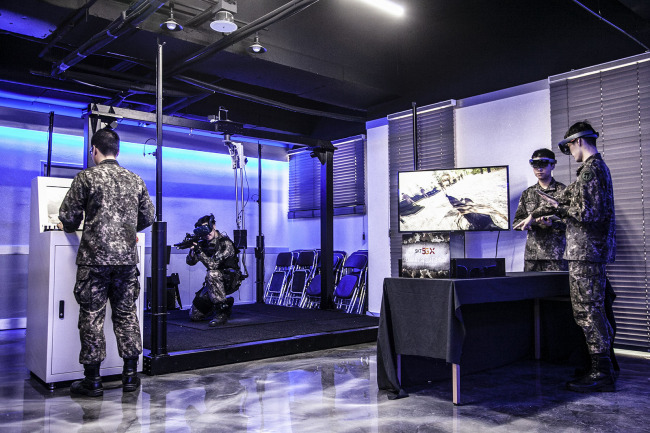 Once VR-based shooting drills are introduced, SKT said cadets will be able to experience almost any combat drill with physical firearms and a virtual screen. The simulated training will reflect realistic combat environments, such as engaging with moving targets in the night. The military school is also expected to provide advanced training on war games using technology for augmented reality, SKT said. The AR-based training helps cadets make informed decisions at command and control. The Army has been accelerating its efforts to employ advanced technologies in a future battlefield. Last year, it launched a hybrid unit of drones and robots for surveillance operations and actual combats. Due to the hyperspeed and low-latency 5G network, the military academy can expand the scope of simulated military training, SKT said. Up to 200 cadets can go through the virtual drills simultaneously. The advanced network will also transform cadets’ daily lives at gyms and classrooms. SKT said each cadet will be provided with a wearable digital device for physical monitoring and academic purposes.